Home Sweet Home: Happy Chinese New Year Everyone! 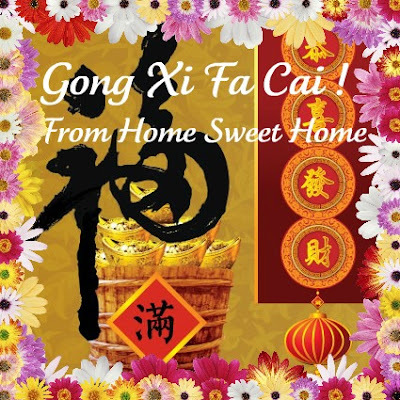 Home Sweet Home would like to greet everyone a happy and prosperous Chinese New Year. So what you should normally do in your homes prior to the celebration? 1.) Clean your house to get rid of bad energies and attract positive aura. spirits and chase them away. 3.) Fill those platters with Mandarin oranges and other citrus fruits. 4.) Fill those trays with candies and dried fruits. 5.) Get a hair cut and prepare your new red clothes. Happy Chinese New Year, Krizza! Festive ba ang celebration jan? That must be fun! Kami Naman dito since Chinese pastor si hubby we had Chinese new year celebration as well just today at church. Hong pao (angpaw sa pinoy) for everybody and ate dumplings and tikoy for lunch. Sarap! You know medyo nag-isip lang ako ng konti kanina, kasi they are Christians and then they celebrate a lot of superstitious beliefs kinds of celebration. But then alam mo, I talked to my husband about this at naliwanagan ako. They did not entirely followed the real Chinese tradition na may mga meaning lahat but they changed the concept into a Christian way. Lahat ng ginawa kanina ay ineliminate na lahat ng pwedeng ieliminate na against sa biblical teachings, related everything to God instead of other gods and only enjoyed eating together. I was delighted to know about it and I actually have a blog sa Women's Choice. Ayun, dumaldal na pala ko. haha! Haha.. I like the way we discuss about this. Gaya ng sabi mo, you give in with their practices for sight seeing, that's fine. Ako lang kasi, I won't paypay(bowing to the dead) kasi that will be against my faith as a Christian. Sight seeing na lang din ang beauty ko. I don't judge anyway about how they do this. Tutal wala na sa mga in-laws ko din ang ganitong practices. May mga particular things lang naman. Haba na naman noh? haha. Magkaisa tayo dun sa 'my faith is my faith'. Yun ang faith nila that they practice, and so I will practice my faith also. Kaboom ako nito sa Miss Universe pageant if ever!! Haha!